Do you ever see advertisements that always make you happy, but never really think of the company or brand? For me, that brand is Clarks Originals. While I always thought of Clarks as 'sensible footwear', the Clarks girl that I saw in the images was a girl that seemed fun, stylish, friendly, and smart. 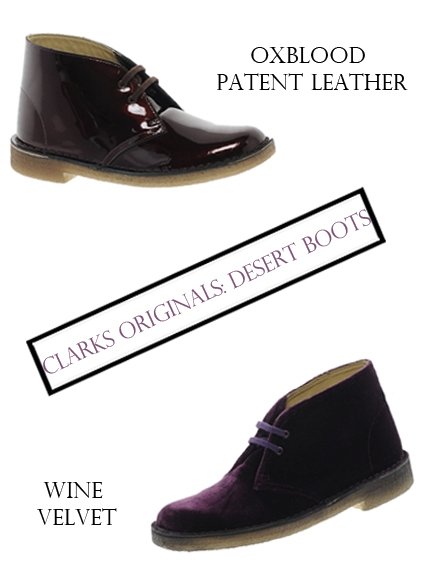 Out of all of their pieces, the Clarks Original desert boots are my favorite. "Inspired by the crepe-soled boots worn by British Officers in World War II", this style was first introduced to me by my mom who has been a fan since her high school days, and when I was scrolling through Asos I came across the two featured above. Clearly, this is a style that has stuck around, and intends to. In two perfect colors (oxblood and wine) and fabrics (patent leather and velvet) for fall and winter, these can serve as a different and equally stylish variation from your everyday ankle boots, and just as stylish as durable, will last forever. Which is your favorite from the two featured above? I think I'm leaning towards the velvet wine pair. These are also pretty fun.